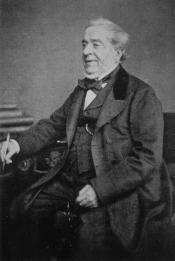 I’m sure some of you have heard of London-based undertaker William Banting (1797-1878), who was the first to popularize a low-carb diet that formed the basis of modern-day diets (think Atkins). Banting was an upper middle-class funeral director whose family held the Royal Warrant for burials for five generations, until 1928; George III, George IV, Prince Albert, and Queen Victoria were buried by the Banting family. There’s plenty of commentaries on Banting’s diet floating around the Internet. A retired widower, he was obese, 5’5 and 202lbs at age 66, his heaviest weight. He wore a truss to hold in place an umbilical rupture. His weight—and the associated complications—was so bad he could not stop to tie his shoe, and had to go down the stairs backwards to limit the pain of weight on his knees and ankles. He tried various attempts to drop some pounds: “sea air and bathing in various localities, with much walking exercise; taken gallons of physic and liquor potassae, advisedly and abundantly; riding on horseback; the waters and climate of Leamington many times, as well as those of Cheltenham and Harrogate frequently…” All of these were in vain. In 1862, after finding his eyesight failing and his hearing greatly impaired, Banting consulted an aural surgeon, but was disappointed with the surgeon’s medical approach: He “made light of the case, looked into my ears, sponged them internally, and blistered the outside, without the slightest benefit, neither inquiring into any of my bodily ailments, which he probably thought unnecessary, nor affording me time to name them.” After the surgeon went on holiday, Banting sought other assistance to relieve him from his ailments. He likely visited the Royal Dispensary for Diseases of the Ear (est. 1816), which in 1862, was directed by the aural surgeon William Harvey (1805/6-1876/9). Harvey was a well-known aurist in London and had a steady career as a surgeon. He was educated at Guy’s Hospital and practiced general surgery for a few years before establishing himself as an aural specialist and publishing The Ear in Health and Disease in 1854. In addition to his post at the Royal Dispensary, Harvey was also aural surgeon to the Freemason’s Asylum for Female Children and the Great Northern Hospital. As he repeated often, he bore no relation to the physician William Harvey who experimented with blood circulation. Upon examining Banting’s ears and assessing his obese stature, Harvey explained that the deafness was symptom of fat deposits in the Eustachian tubes. He advised Banting to overhaul his diet to lose weight, explaining that as the pounds came off, his hearing would be improved. Banting was advised to abstain from bread, butter, milk, sugar, beer, and potatoes, which had “been the main…elements of [his] existence.” Instead, he was to eat four meals a day composed of meat, greens, fruit, and dry wine. The diet worked: Banting lost 46 pounds in a few months. He was so astounded by the results he gave Harvey an extra £50 to his usual fees, to be distributed amongst his favourite hospitals. In addition, Banting published a pamphlet in the form of an open testimonial, Letter on Corpulence, Addressed to the Public (1863). The first edition was self-published at his own expense, but became so popular that he sold it; later editions were published by Harrison, London. The pamphlet and Banting’s dietary success became so well-known that “Do you bant?” became a referred to fashionable way of asking whether people were trying to drop a few pound. Where did an aurist get the idea for dietary management as a way to improve hearing? According to Harvey, in 1856, while he was out for a walk in Paris, he came across an announcement for a lecture by Claude Bernard at the Paris School of Medicine. Through Bernard’s lectures, Harvey learned how starch could affect the body negatively and played a role in the production of insulin. Diabetics management in particular, could be handled with a proper diet—and of course, assist in losing weight. Unfortunately for Harvey, false rumours spread in London that the diet had ruined Banting’s health, and that Harvey was to blame. Furthermore, his practice suffered as he was constantly ridiculed for being unable to explain why the diet worked; medical practitioners criticized the diet as “unscientific” and Harvey’s application of diet management as a process that could not be replicated under similar variables. 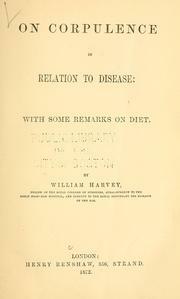 In 1872, Harvey published his own account of the diet, On Corpulence in Relation to Disease as a way to address some of the critique against him. In particular, he outlined how his treatment was misapplied in many cases, applied rashly and indiscreetly without proper medical advice. And of course, he points out, it “was…natural to expect that a pamphlet on a dietary for the cure of Corpulence, coming from a lay source, would not have found much favour with the profession, and that it would receive some severe criticism.”The book is technically detailed, with information on the physiology and anatomy of the body, how fat deposits affect tissues and muscles, and symptoms of illness that arise from obesity. He also provides an explanation of how fatty deposits can enter the Eustachian tubes and result in temporary deafness through the mucus membranes. 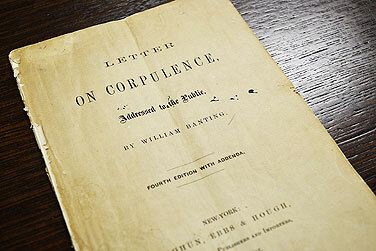 William Banting, Letter on Corpulence, Addressed to the Public (1863), 12. William Harvey, On Corpulence in Relation to Disease (1872), vi. ← Green Light: Mr D.